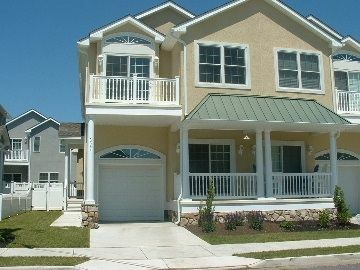 Brand New Luxury Town home at the Southern End of Wildwood Crest Located Just a Half Block from the Beach. Our Home Has Everything You Need for Your Family Vacation. a Living Room with a Gas Fireplace, 32' LCD TV, Including HBO, DVD; Dining Room that Sits 8, Full Modern Kitchen / Appliances with Granite Counter Tops, Spacious Master Bedroom Suite with King Size Bed, 40' LCD TV, and Bath; Guest Room with Queen Size Bed, 32' TV, and Bath, Sitting Room with Sleeper Couch, 32' LCD TV, Two Decks to Sit and Read the Morning Paper or Sip Drinks in the Afternoon While Enjoying the Beach / Ocean Views, Outside Shower, Backyard with a Gas Grill and Table and Chairs to Enjoy After a Long Day at the Beach. Everything You Need is Within a Short Distance; 8 Minutes to Historic Cape May with its Quaint Shops, 3 Minutes to the Famous Wildwood Boardwalk, and 30 Minutes to the Atlantic City Casinos. the Wildwood Convention Center Which Hosts Numerous Star Studded Events is Close by and Festivals, Including the Cape May Jazz Festival, Irish and Italian, Are Held Throughout the Year. Small garage, fits small car. Everything was well beyond our expectations. This is a great location for a family vacation. The townhome is lovely and fully equipped with everything. The owner is friendly and helpful. The beach is minutes away and the sand there is lovely. It is nice to be near enough to reach the Wildwood boardwalk without actually being in Wildwood itself. Thank you very much for the kind words. We do our best to make our guests fell welcome and enjoy their vacation. This house definitely made our family vacation memorable. There was ample room for our entire family and made us feel like we were on a luxury getaway. The master bedroom was quite large and had it's own balcony. Simply said, this is a great house in a great location. The walk to the beach is literally one minute! Highly recommended! Girls Getaway Weekend - Fabulous!!! Two ladies and I planned a Girls Getaway weekend at this beautiful townhome. We thoroughly enjoyed the home and all of its amenities. The family was very hospitable and graciously answered all of our questions. The home was exactly as depicted in the photos. It was nicely decorated and comfy. There were numerous 9-11 celebrations and a craft fair scheduled during this weekend. So we had plenty to do. The location was great. Not far from Cape May, minutes to the Wildwood Boardwalk and there were plenty of restaurants nearby. I'm looking forward to renting this home again in the upcoming future. This home is so well thought out. It is roomy and yet organized in such a way that it feels cozy for a family to visit and spend time together. The decor is contemporary and new. The walk to the beach was so convenient and even doable for my 80 year old father. The whole street is quiet and family oriented. We appreciate how easy the owner was to deal with. We would stay here again! Beautiful unit, inside and out! My girlfriend and I stayed at this rental Fourth of July week this past summer. This beautiful townhome was in “like new” condition. The owner spared no expense in overall furnishings and cleanliness of this unit, we were very impressed! The beach was an easy walk to get to and the area was quiet and peaceful. The price in my opinion was very reasonable compared to the numerous other rentals I reviewed. I chose this location because it was far enough away from the crowds of the boardwalk and nightlife, yet close enough to them and Cape May. Two items I want to mention also; this building is a duplex and the owners utilize the unit next door all summer, and they’re very meticulous about their property. The second thing is that I received my security deposit over two months after the end of the rental, and that was after making three inquiries; however I did eventually receive it without any further problem. We are very meticulous about our property and expect our tenants, while enjoying their stay, to care for our home in a similar manner. We now have numerous repeat renters who appreciate the quality of our rental property. Some repeat renters are not charged a security deposit because when they leave at the end of their stay, the home will look just like it did when they arrived. As far as returning security deposits we will be extending the turn around time from 30 days to 45 days. We normally wait for the monthly cable bill to check for additional charges, i.e. movie rentals, to be deducted from the security deposit. Lastly, our home is available to anyone over the age of 25, not limited to 55+, or families with children.